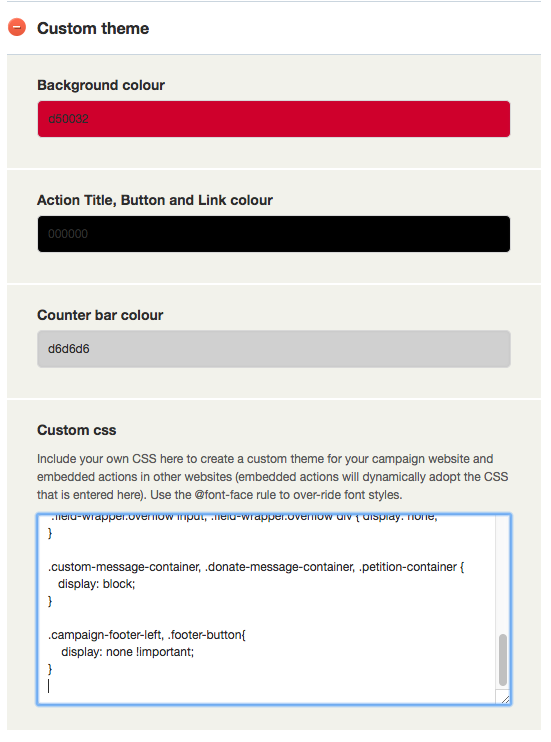 You can go beyond basic styling on Do Gooder by customising the CSS of your campaigns. This gives you much greater control over the look and feel as well as certain functionality. Some fun hacks are below but you can do as much as CSS allows you to do. All of this power and flexibility is available on the Goodest PRO plan allows you to modify CSS on Do Gooder. To paste in CSS, Edit your campaign and open the Custom Theme tab. the first three options are basic settings available to all plans and can be used or over-written with CSS. The CSS field is where you paste in your code. Set the background colour of text blocks in Pages to transparent so they are not white which otherwise creates a banded effect on paragraphs.